Last edited by Jafo; 03-30-2014 at 09:25 PM. Re: Where are yurt communities? I would be interested in learning about any yurt communities in the U.S.
samsam and Trooper like this. I'll jump in with a side comment that there are likely VERY few yurt communities in AZ due to the extreme heat. Everyone I know that has either lived or visited AZ has had AC to come home to after a day out. I've been there myself and my girlfriends parents home had AC, and that was back in 1973 when household AC was still considered a luxury by most folks. My canvas covered uninsulated yurt here in CO gets extremely hot in temperatures that are a good 10 degrees cooler than typical for AZ. Even with the wall cover rolled up and the roof vent wide open, it is HOT in there. Good luck. I hope you find a few like minded individuals. AZ is a beautiful state. The most likely places I can think of for a yurt community in AZ would be Prescott, Sedona, or Flagstaff. Maybe Cottonwood or Jerome, but I think Jerome might be too much of a steep mountain slope for most to consider yurts. Considering it tends to be dry in AZ, maybe swamp coolers rather than AC? Though humidity and yurts don't mix that well, so not sure if that would be the best plan. I lived in AZ for 4 years at an intentional community called Arcosanti. I used swamp coolers there and they would work great as long as the air didn't get too humid. The few times it did get humid, the swamp coolers were useless. Arcosanti had a couple "yurt like" structures. Timber frame construction with solid roof, but used canvas panels for the walls. While doing maintenance work for the community I did have to do repairs for this "yurt". The canvas panels ripped pretty regularly and got holes easily. Same with the windows which were only screens or plastic sheeting. Interior was pretty basic, with multiple bays to be used for sleeping, or for storage for the farm. 2nd story was more open with only two dividing walls. This sort of "yurt" was unbarably hot in the summers of AZ, and way too cold in the winter, leaving only spring and fall as times when it could be lived in. The other seasons it was used for storage for the farm. 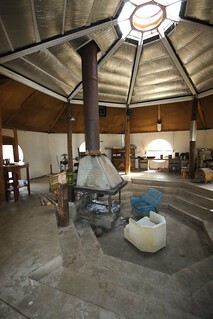 The second building was much less yurt like other than the octagon shape, being made from concrete and lumber. But with the insulated roof it actually stayed quite cool in the summer with no air con or swamp cooler. And the single fire place kept it warm in the winter. The space was commonly used as the workshoper's living room as they lived in 8'x8' concrete cubes. But was also used for parties and even small concerts. As I mentioned this structure actually stayed pretty cool in summer. While I would imagine a real yurt in AZ would get pretty warm, if well insulated and maybe a tarp to shade it, it might be possible to survive the AZ heat. Thanks for the photos. I definitely dig the band pics. I think a swamp cooler would work great in the wide open space of a yurt. The swamp cooler could be installed on a slab or low platform and ducted into the wall. 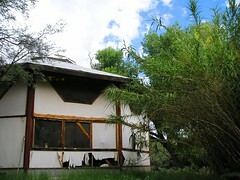 A conventional 'room sized' wall/window ac unit installed in similar fashion would work on a smaller yurt. You'll need a 110 V supply for either. Both would be affordable installs. If I lived year around in AZ in a residential yurt I'd definitely consider AC in the bedroom a necessity to insure a good nights rest. Good luck. You'll get it worked out. A tarp rigged a couple feet above the yurt cover will substantially aid cooling in AZ. I can take working in 100+ degree heat a whole lot better knowing I'll have a cool rest that night.